of its members. The program focuses on character building, leadership, and promotes a healthy, drug-free lifestyle. 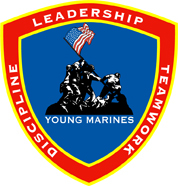 The Young Marines is the official youth program of the U.S. Marine Corps and the focal point for the Marine Corps' Youth Drug Demand Reduction efforts. Columbia, and, Germany, Japan and affiliates in a host of other countries. and recommendations provided with each person's registration. Upon joining a local Young Marine unit, youth undergo a 26-hour orientation program, generally spread out over several weekly meetings. This orientation program is affectionately called "Boot Camp." The youth learn general subjects such as history, customs and courtesies, close order drill, physical fitness, and military rank structure. After graduating from Young Marine "Boot Camp", the youth have the opportunity to learn more new skills, earn rank, wear the Young Marine uniform and work toward ribbon awards. Young Marines earn ribbons for achievement in areas such as leadership, community service, swimming, academic excellence, first aid and drug resistance education. National Summer Programs of: Adventures, Challenges, Encampments, and Schools (SPACES). with the younger child in mind. In contrast, older Young Marines can participate in Challenges. Challenges consist of training in areas such as survival skills, wilderness training, and water-based activities. Young Marine Encampments provide the opportunity for Young Marines of all ages to gather together and train as a large unit of up to 700 youth at a time. Over 3,000 Young Marines participate in the SPACES programs each year. Headquarters and the second to the Bakersfield Young Marine unit in California. The Young Marines are honored to have R. Lee Ermey as their official celebrity spokesperson. 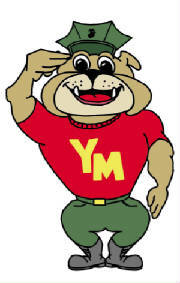 Mr.
Chester, the puppy bulldog, is the Young Marines official mascot. Chester enjoys all the benefits of Young Marine membership such as the opportunity to earn rank and ribbons, wear the Young Marine uniform, and a free subscription to the Young Marine Esprit magazine. Chester sometimes even makes guest appearances at unit meetings, graduations, and training conferences. For one week in November each year, Young Marine units across the country celebrate Young Marines Veterans Appreciation Week (YMVAW). The purpose of the campaign is to challenge our Young Marines to dedicate some of their time to help our nation’s veterans and to demonstrate, through their actions, their sincere appreciation for our veterans’ service to our country. Unit projects include sending thank you cards to hospitalized veterans, cleaning up a disabled veterans yard, visiting veterans in the hospital, or simply setting up a community function to socialize with local veterans. To promote the mental, moral and physical development of its members. To instill in its members the ideals of honesty, fairness, courage, respect, loyalty, dependability, attention to duty, love of God and fidelity to our country and its institutions. To stimulate an interest in and respect for, academic achievement and the history and traditions of the United States of America. To promote physical fitness through the conduct of physical activities, including participation in athletic events and close order drill. To advocate a drug-free lifestyle through a continual drug prevention education program.